While reviews should primarily focus on production quality, actors’ talents, and the director’s vision, it is sometimes difficult to set aside a story’s shifting premise and the script’s cliché writing. Kristen van Ginhoven and her troupe of excellent performers, unfortunately, have little to work with, although the actors especially, pore themselves into the roles as much as can be possible. Set in Canada in the 1980’s, with frequent flashbacks to a decade earlier, are the adult members of the McKay family – Mr. & Mrs. along with a brother and sister-in-law. It’s not an interesting bunch so their conflicts are boring. 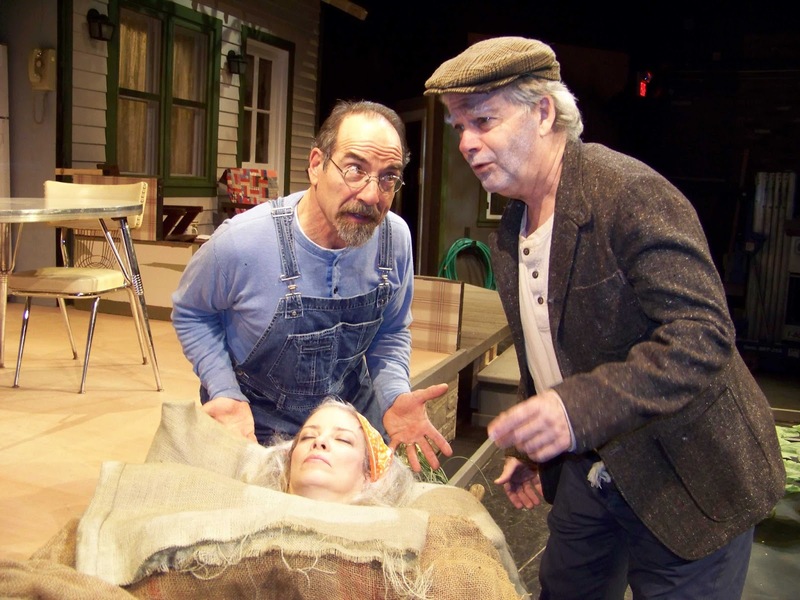 Admittedly, the play revs up toward the end of Act I with the presence of the town drunk, bringing with him the more important parts and true essence of the story – the personal experiences of veterans and effects of war. However, this element in the script is secondary. Not that the theme should immediately hit the audience in the face, but it seems ancillary to the plot. Barry Press and Jeannine Haas in the lead roles are quality actors portraying an old married couple who often take each other for granted. Sam Rush’s character, arriving late in the play, realistically exemplifies narcissism and meanness. John Thomas Waite, perhaps one of the finest actors frequently seen on the Majestic’s stage, is given the role of the town drunk which, for the most part, is played without individuality. There are numerous distractions throughout, the most frequent being one character’s constantly changing his shoes. Only two off-handed lines in the script indicate his reason for this habit. It’s a guess that this was a director’s choice that ended up being a nuisance. Greg Trochlil continues to work magic on set design. The kitchen/porch complete with essence of a roof is enough to depict an entire house. Planks of wood and a dirty window create a work shed. This house becomes a home that “real people” live in. Perhaps the best part of the experience of “The Cabbage Patch” was the full house in attendance on a Wednesday night. This speaks to the reputation of the Majestic and its large following.